How to transfer the “Big Brother” software to another computer? There is the following plan of action: 1) Stop the server, and close all clients. 2) Run D: \ BigBrother \ Server \ Uninstall.bat . The service will be uninstalled. 3) Copy the D: \ BigBrother \ directory to another PC. 4) Connect the converter to the RS485 bus wire (install drivers if necessary). 5) Run D: \ BigBrother \ Server \ Install.bat. It will install the service. 6) Run the client. 7) Check the path to the database in the “Settings – General” section. 8) Check the path to the database for the device server in the “Setup – Device server” section; the “Service” tab. 9) Check the settings of the information ports in the device manager (set it in the table in the “Settings – Device server” tab if necessary; the “Settings” tab). 10) Check the directories for database backup. 11) Start device server.There is the following plan of action: 1) Stop the server, and close all clients. 2) Run D: \ BigBrother \ Server \ Uninstall.bat . The service will be uninstalled. 3) Copy the D: \ BigBrother \ directory to another PC. 4) Connect the converter to the RS485 bus wire (install drivers if necessary). 5) Run D: \ BigBrother \ Server \ Install.bat. It will install the service. 6) Run the client. 7) Check the path to the database in the “Settings – General” section. 8) Check the path to the database for the device server in the “Setup – Device server” section; the “Service” tab. 9) Check the settings of the information ports in the device manager (set it in the table in the “Settings – Device server” tab if necessary; the “Settings” tab). 10) Check the directories for database backup. 11) Start device server.There is the following plan of action: 1) Stop the server, and close all clients. 2) Run D: \ BigBrother \ Server \ Uninstall.bat . The service will be uninstalled. 3) Copy the D: \ BigBrother \ directory to another PC. 4) Connect the converter to the RS485 bus wire (install drivers if necessary). 5) Run D: \ BigBrother \ Server \ Install.bat. It will install the service. 6) Run the client. 7) Check the path to the database in the “Settings – General” section. 8) Check the path to the database for the device server in the “Setup – Device server” section; the “Service” tab. 9) Check the settings of the information ports in the device manager (set it in the table in the “Settings – Device server” tab if necessary; the “Settings” tab). 10) Check the directories for database backup. 11) Start device server.There is the following plan of action: 1) Stop the server, and close all clients. 2) Run D: \ BigBrother \ Server \ Uninstall.bat . The service will be uninstalled. 3) Copy the D: \ BigBrother \ directory to another PC. 4) Connect the converter to the RS485 bus wire (install drivers if necessary). 5) Run D: \ BigBrother \ Server \ Install.bat. It will install the service. 6) Run the client. 7) Check the path to the database in the “Settings – General” section. 8) Check the path to the database for the device server in the “Setup – Device server” section; the “Service” tab. 9) Check the settings of the information ports in the device manager (set it in the table in the “Settings – Device server” tab if necessary; the “Settings” tab). 10) Check the directories for database backup. 11) Start device server. What is the difference between the NAC-01 and iBC-01 Light network controllers? There general list of devices is not displayed when adding a new device to the system. What to do? Go to the “Administration” tab in the “Control Panel”. Click the “Select All” button for the user with administrative rights; and then click the “Save” button.Go to the “Administration” tab in the “Control Panel”. Click the “Select All” button for the user with administrative rights; and then click the “Save” button.Go to the “Administration” tab in the “Control Panel”. Click the “Select All” button for the user with administrative rights; and then click the “Save” button.Go to the “Administration” tab in the “Control Panel”. Click the “Select All” button for the user with administrative rights; and then click the “Save” button. What is the difference and what are the advantages of network / local controllers? Network access controllers perform not only the function of the electromagnetic lock (as the local ones do). They also remember the time and the key, which was used to open it. Network controllers can not only control different types of locks. They can also control turnstiles, barriers, gates, etc. The main purpose of network controllers is access control and working time recording. Local controllers cannot be networked. This eliminates the interaction between each other. In other words, each local controller will be programmed separately. There is also no possibility to keep records of the events for the object in the local controllers. Network controllers do not have these problems. 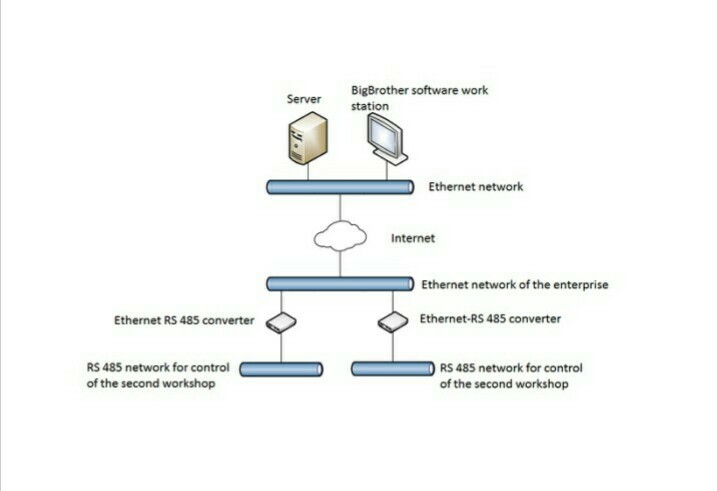 Networked controllers are considered as a single system of protection / access with the ability to maintain an event log and flexible scheduling.Network access controllers perform not only the function of the electromagnetic lock (as the local ones do). They also remember the time and the key, which was used to open it. Network controllers can not only control different types of locks. They can also control turnstiles, barriers, gates, etc. The main purpose of network controllers is access control and working time recording. Local controllers cannot be networked. This eliminates the interaction between each other. In other words, each local controller will be programmed separately. There is also no possibility to keep records of the events for the object in the local controllers. Network controllers do not have these problems. Networked controllers are considered as a single system of protection / access with the ability to maintain an event log and flexible scheduling.Network access controllers perform not only the function of the electromagnetic lock (as the local ones do). They also remember the time and the key, which was used to open it. Network controllers can not only control different types of locks. They can also control turnstiles, barriers, gates, etc. The main purpose of network controllers is access control and working time recording. Local controllers cannot be networked. This eliminates the interaction between each other. In other words, each local controller will be programmed separately. There is also no possibility to keep records of the events for the object in the local controllers. Network controllers do not have these problems. Networked controllers are considered as a single system of protection / access with the ability to maintain an event log and flexible scheduling.Network access controllers perform not only the function of the electromagnetic lock (as the local ones do). They also remember the time and the key, which was used to open it. Network controllers can not only control different types of locks. They can also control turnstiles, barriers, gates, etc. The main purpose of network controllers is access control and working time recording. Local controllers cannot be networked. This eliminates the interaction between each other. In other words, each local controller will be programmed separately. There is also no possibility to keep records of the events for the object in the local controllers. Network controllers do not have these problems. Networked controllers are considered as a single system of protection / access with the ability to maintain an event log and flexible scheduling. What is the difference and what are the advantages of USB RS-485 / Ethernet RS-485 converters? What is the difference between the following operating modes: impulse, trigger, hold? Impulse mode (by default) changes the state of the device’s output to the opposite for a programmed time (from 1 sec). The output condition is reversed until the next positive key identification in trigger mode. The hold mode implies an altered state of the output; while an authorized key is applied to the reader (the output will be restored once the key is taken away).Impulse mode (by default) changes the state of the device’s output to the opposite for a programmed time (from 1 sec). The output condition is reversed until the next positive key identification in trigger mode. The hold mode implies an altered state of the output; while an authorized key is applied to the reader (the output will be restored once the key is taken away).Impulse mode (by default) changes the state of the device’s output to the opposite for a programmed time (from 1 sec). The output condition is reversed until the next positive key identification in trigger mode. The hold mode implies an altered state of the output; while an authorized key is applied to the reader (the output will be restored once the key is taken away).Impulse mode (by default) changes the state of the device’s output to the opposite for a programmed time (from 1 sec). The output condition is reversed until the next positive key identification in trigger mode. The hold mode implies an altered state of the output; while an authorized key is applied to the reader (the output will be restored once the key is taken away). What is the difference and what are the advantages of 1-Wire / Weigand 26 interfaces? The 1-Wire interface allows one to emulate Dallas DS1990 access keys. This provides an opportunity to use card readers in various systems, which support this interface. The main advantage is that only two wires are used for data transmission: Data and common wire. The disadvantage is the fact that the length of the communication line between the controller and the reader should not exceed 30 meters. Weigand interface is actually the main standard of data transmission of access control systems. It is well-known for its simplicity and reliability. The length of the communication line while using this protocol can be up to 120 meters.The 1-Wire interface allows one to emulate Dallas DS1990 access keys. This provides an opportunity to use card readers in various systems, which support this interface. The main advantage is that only two wires are used for data transmission: Data and common wire. The disadvantage is the fact that the length of the communication line between the controller and the reader should not exceed 30 meters. Weigand interface is actually the main standard of data transmission of access control systems. It is well-known for its simplicity and reliability. The length of the communication line while using this protocol can be up to 120 meters.The 1-Wire interface allows one to emulate Dallas DS1990 access keys. This provides an opportunity to use card readers in various systems, which support this interface. The main advantage is that only two wires are used for data transmission: Data and common wire. The disadvantage is the fact that the length of the communication line between the controller and the reader should not exceed 30 meters. Weigand interface is actually the main standard of data transmission of access control systems. It is well-known for its simplicity and reliability. The length of the communication line while using this protocol can be up to 120 meters.The 1-Wire interface allows one to emulate Dallas DS1990 access keys. This provides an opportunity to use card readers in various systems, which support this interface. The main advantage is that only two wires are used for data transmission: Data and common wire. The disadvantage is the fact that the length of the communication line between the controller and the reader should not exceed 30 meters. Weigand interface is actually the main standard of data transmission of access control systems. It is well-known for its simplicity and reliability. The length of the communication line while using this protocol can be up to 120 meters. How to harmonize the control of the electromagnetic lock and the iBC-01 Light controller? Go to “Control panel” – “Devices” – (select control controller) – check the “Invert condition” box above the controller’s drawing of the “Outputs” tab.Go to “Control panel” – “Devices” – (select control controller) – check the “Invert condition” box above the controller’s drawing of the “Outputs” tab.Go to “Control panel” – “Devices” – (select control controller) – check the “Invert condition” box above the controller’s drawing of the “Outputs” tab.Go to “Control panel” – “Devices” – (select control controller) – check the “Invert condition” box above the controller’s drawing of the “Outputs” tab. How to program the keys? There are possible several variants of the sequence of actions. In general case you should do the following: – to create access rules (permission to cross control points) for users in the corresponding section of the program. – to create the user; – to assign an access level to the user; – to assign an unused key to the user (you should select either from the list of keys or by reading the key code on the reader); – to program the device.There are possible several variants of the sequence of actions. In general case you should do the following: – to create access rules (permission to cross control points) for users in the corresponding section of the program. – to create the user; – to assign an access level to the user; – to assign an unused key to the user (you should select either from the list of keys or by reading the key code on the reader); – to program the device.There are possible several variants of the sequence of actions. In general case you should do the following: – to create access rules (permission to cross control points) for users in the corresponding section of the program. – to create the user; – to assign an access level to the user; – to assign an unused key to the user (you should select either from the list of keys or by reading the key code on the reader); – to program the device.There are possible several variants of the sequence of actions. In general case you should do the following: – to create access rules (permission to cross control points) for users in the corresponding section of the program. – to create the user; – to assign an access level to the user; – to assign an unused key to the user (you should select either from the list of keys or by reading the key code on the reader); – to program the device. Which biometric controllers (for a fingerprint) operate in on-line mode? Anviz T5 and Anviz T5 Pro biometric fingerprint controllers, which are integrated into the system, provide the possibility of information exchange in on-line mode. ZK MA-300 controller does not have this capability. But it can work according to schedules.Anviz T5 and Anviz T5 Pro biometric fingerprint controllers, which are integrated into the system, provide the possibility of information exchange in on-line mode. ZK MA-300 controller does not have this capability. But it can work according to schedules.Anviz T5 and Anviz T5 Pro biometric fingerprint controllers, which are integrated into the system, provide the possibility of information exchange in on-line mode. ZK MA-300 controller does not have this capability. But it can work according to schedules.Anviz T5 and Anviz T5 Pro biometric fingerprint controllers, which are integrated into the system, provide the possibility of information exchange in on-line mode. ZK MA-300 controller does not have this capability. But it can work according to schedules. What is the essence of the “Anti-pas back” mode? “Anti-pas back” mode provides a possibility to control the location of the owner of a certain key in the controlled territory, or outside it. The essence of this mode lies in the impossibility of repeated entry or exit events. That means that duplicated attempts to perform a repeated action will be blocked. Thus, there is no possibility to leave the territory without entering it and vice versa.“Anti-pas back” mode provides a possibility to control the location of the owner of a certain key in the controlled territory, or outside it. The essence of this mode lies in the impossibility of repeated entry or exit events. That means that duplicated attempts to perform a repeated action will be blocked. Thus, there is no possibility to leave the territory without entering it and vice versa.“Anti-pas back” mode provides a possibility to control the location of the owner of a certain key in the controlled territory, or outside it. The essence of this mode lies in the impossibility of repeated entry or exit events. That means that duplicated attempts to perform a repeated action will be blocked. Thus, there is no possibility to leave the territory without entering it and vice versa.“Anti-pas back” mode provides a possibility to control the location of the owner of a certain key in the controlled territory, or outside it. The essence of this mode lies in the impossibility of repeated entry or exit events. That means that duplicated attempts to perform a repeated action will be blocked. Thus, there is no possibility to leave the territory without entering it and vice versa. How to get the license of ACS "Big Brother"? To get the license you need: 0) Run the program “BigBrother – User workplace” 1) Go to the “Settings – License” section 2) From the right side from the bottom click the “Request a license” button 3) By e-mail 3320098@gmail.com send a letter containing: a) the license number generated by the program; b) who requests a license (contact phone number, name); c) the owner of the license; d) list the options for which you need a license; e) specify who and when paid for the selected options. 4) Get an answer and follow the steps to install the license.To get the license you need: 0) Run the program “BigBrother – User workplace” 1) Go to the “Settings – License” section 2) From the right side from the bottom click the “Request a license” button 3) By e-mail 3320098@gmail.com send a letter containing: a) the license number generated by the program; b) who requests a license (contact phone number, name); c) the owner of the license; d) list the options for which you need a license; e) specify who and when paid for the selected options. 4) Get an answer and follow the steps to install the license.